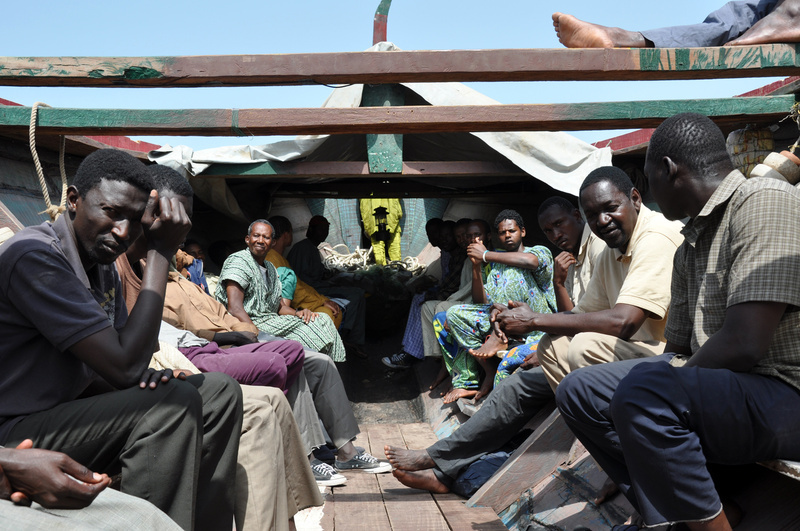 The fishing boat with its captain and 30 passengers is not really equipped to travel long distances in Atlantic waters. Pirogue is a general term to describe boats such as canoes or ‘dugouts’. 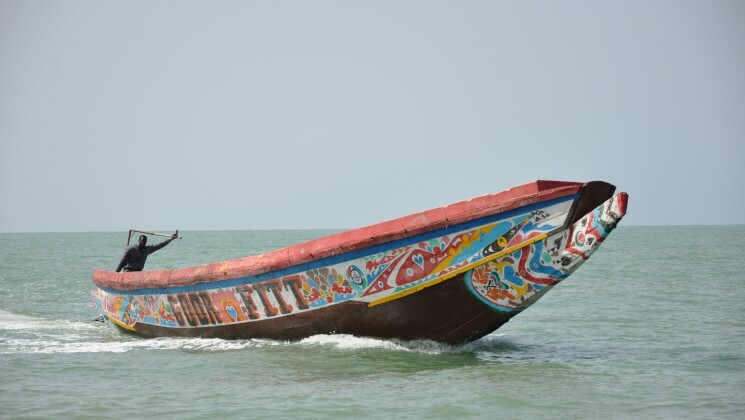 On the West African coast large versions of the traditional canoe shape, powered by a single motor, are used for fishing. The local fishing industry is in decline from overfishing (including factory fishing by trawlers from the EU) and this gives a further impetus to the attempts to leave the region and migrate to where there might be jobs. Thousands have left the coasts of Senegal and Mauritania in open boats, attempting to reach European beaches. Most of those who have survived the trip have ended up in the Canaries, part of Spain. This film ends with a title informing us that 1 in 6 of these illegal migrants fails to survive – and many of the others are then ‘repatriated’ back to their home country. Moussa Touré’s film is based on a novel and it tells the tale of one such journey from Dakar. In one sense the narrative is familiar, comprising a mix of the standard illegal migration story (what motivates both the migrants and the people who transport them?) and the ‘forced community trapped in a boat’ genre typified by the Hollywood disaster movie. One of the earliest examples of the latter was Hitchcock’s Lifeboat. The tragedy of La pirogue is that the travellers have chosen this ordeal. Some of them know the dangers, others are so desperate to leave that they probably don’t want to know. Accommodation is rudimentary in the pirogue. The film is handsomely mounted and looks good in a CinemaScope presentation. The narrative provides us with two main groups: the boat’s captain and his brother plus the trip’s organiser and others in their circle as opposed to the passengers who represent people from the interior including some from Guinea who speak a different language. Allied to these differences are familiar oppositions of young and old, secular and religious. There is enough potential narrative conflict to sustain the film’s relatively short running time and I found it gripping. If I’m honest though, I did think that as a suspense film – who will survive the trip, what kinds of dangers will the boat face? – there were too many clues to what might happen and I found myself in that familiar position of admonishing characters for not being careful enough with essential items of equipment. It will be interesting to see how the film goes down with audiences. It’s a mainstream popular film from Senegal with production values commensurate with European funding and technical support. My fear is that it might fall between two stools – perhaps not enough excitement for the mainstream but possibly not quite enough characterisation and observation for the arthouse. So far, it hasn’t got UK distribution, though it has opened in France and I think it is booked for North America. The people in the boat are a divided community and I’m not sure what this says about Senegal if the film is in any way metaphorical. I think it’s this thought that makes me wish that we found out more about the individual characters and their problems. But despite my slight misgivings I urge you to see this if you get the chance. La pirogue opens the Bristol-based Afrika Eye Film Festival tonight November 9 and it screens as part of the Cornerhouse ‘French Connections’ season on Monday November 12. This entry was posted in African Cinema and tagged Senegal. Bookmark the permalink.